Eduardo Antelmi, Francesco Capriati, Nicholas Gernone e Francesco Turchiano from Majorana High School (Bari – Italy) are the authors of “Posidonia Oceanica_Unexpected Resource”, the winning video of the MED-DESIRE Award for the best video on sustainable energy. The competition, organized by ARTI, was addressed to young people and it was based on videos expressing an idea or an innovative project related to the five challenges of the SmartPuglia 2020, the Puglia Region Smart Specialization Strategy: sustainable cities and territories; health, well-being and socio-cultural dynamics; sustainable energy; creative industries and cultural development; food security and sustainable agriculture. Only 5 videos over 15 (4 on sustainable energy) reached the final, held on May 21 within the Innovation Festival. 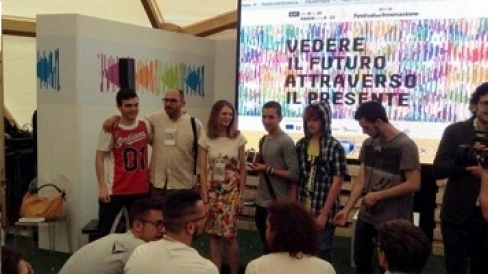 The jury rewarded two videos: "Solar car", realized by the Fermi High School, which won a visit to a movie set shot in Puglia, and "Posidonia Oceanica_ Unexpected Resource" realized by Majorana High School, winner of the MED-DESIRE special mention. Always considered a waste, the Posidonia Oceanica is, however, an unexpected resource. In the video, the students show how it is possible to build a kennel for pets (represented by Lucky) insulated, comfortable and efficient from an energy point of view, by mixing the algae with water and glue and integrating it into the roof of the building.The Posidonia Oceanica is an excellent insulator that keeps buildings cool in summer and protected from heat during all day long. The Majorana students won a solar power station offered by MED-DESIRE project within the project awareness raising activities.